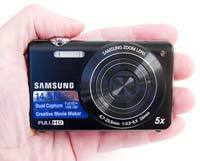 The Samsung ST96 is a 14 megapixel compact camera featuring a Back Side Illuminated CMOS image sensor. The ST96 also offers a 5x optical zoom lens with 26mm wide-angle setting and dual image stabilisation, 1080p HD video recording at 30 frames-per-second, creative movie maker, 2.7 inch LCD screen, 10fps burst shooting, a wide range of special effects, and the intelligent Smart Auto feature which automatically adjusts the camera's settings. The Samsung ST96 is available in black priced at £179.99 / $199.99. Digital cameras are like proverbial buses. No sooner had we published our September 2011 review of the Samsung ST95 than the ST96 joined the manufacturer’s ‘Small and Thin’ line up. Like the ST95, the newer model is shorter than the height of a business card, with official 90mmx55mmx18.7mm proportions meaning it’s very, very similar to its still current predecessor. Sitting well in the palm then, this is a compact that truly is compact. No one will feel discomfort slipping this one into a trouser pocket. In fact it’s almost too easy to forget it is there. The first thing you notice when extracting the camera from its box and setting it down on a desk top is that, in common with Samsung pocket snapshots of the last couple of years, the ST96 has a subtly backwards-leaning design. This is supposed to make for a more comfortable hold in lieu of any proper surface grip. It may seem like a bit of a gimmick, but it’s possible to shoot one-handed with this Samsung and not feel like it could slip from your grasp. We had the black matt model in for review, which otherwise has a totally smooth brushed metal faceplate. The camera also comes with sofa-like feet on the base that are more pronounced towards the front so it stays solidly upright on a tabletop whilst at the same time maintaining its slight lean. Thankfully the camera doesn’t immediately feel like the budget offering it is, with a distinct lack of obvious plastic. As seems to be the trend of late, the resolution of the ST96 is in fact lower than that of its ST95 forebear, which remains in the line-up for now. It offers up 14.52 megapixels from a 14.6MP backside illuminated CMOS sensor (no sniggering at the, er, back), rather than 16.1 effective megapixels from a 16.4MP 1/2.3-inch CCD. Samsung claims the back illumination ensures that the ST96’s chip is twice as sensitive as regular CMOS sensors, therefore indicating the possibility of more detail in low light. Once again Samsung has shoehorned in a 5x optical zoom with the ST96, here supported by optical and digital stabilization and starting out a usefully wide angle 26mm equivalent (in 35mm terms) and running up to 130mm at the telephoto end. The lens boasts a maximum aperture of f/3.3, so specification is again more or less exactly the same as the ST95, although the major difference is that, unlike the ST95, the 2.7-inch LCD screen at the rear isn’t touch sensitive. Rather it’s navigated using the very familiar panel of physical controls ranged alongside it on the right-hand quarter of the camera back. Video resolution is, spec-wise, marginally improved over the ST96. There’s a boost from 1280x720 pixels to a Full HD 1920x1080 pixels at 30fps, with the camera utilising H.264 compression. Filming is commenced or stopped with a press of a dedicated record button placed in the top right hand corner of the backplate, whereby the screen display narrows to present a widescreen vista. The full extent of the optical zoom can be used when videoing, unlike on many cheaper-end models which usually suffer from quite noisy zoom mechanisms. By contrast the ST96’s zoom action, whilst not completely silent, is impressively quiet. The camera offers expanded connectivity options by providing HDMI output, thus allowing allow users to make the most of the video resolution hike by connecting the compact to a flat panel TV set. As usual, photographers will have to pay extra for the necessary cable. Another accessory that is ‘missing’ is a separate mains adapter. Instead we get a mains plug with a USB input, so the standard USB cable (provided) can ingeniously be used for recharging as well as image uploading/downloading. There is some melding of stills capture and video functionality here. 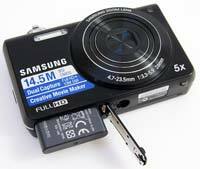 In a literal sense, in that 10 megapixel photos can be captured in the midst of a video recording. Then at the playback stage there is a Creative Movie Maker option, allowing stills and video to be combined in a slideshow. For action photography the camera offers 3.4fps or 10fps burst capture, with slow motion video at 250 or 440 fps further selectable. As a result video gets its own menu mode as well as record button. Though no unattractive by any means, from the outside there is precious little indication that the ST96 is trying to be ground breaking in any way. From the front the Samsung ST96 doesn’t stray too far from any number of identikit pocket cameras, being a very close match in terms of size and headline spec to the likes of Kodak’s M5370, also available for a suggested £130. The retracted zoom with automatically opening and shutting lens cover dominates proceedings at the front of the ST96, with a familiar porthole containing the bulb for the self-timer/AF illuminator lamp located top right. Top left of the lens is a narrow window housing integral flash, its positioning meaning that it’s easy for a stray finger to partly obscure it when simply shooting with the camera handheld. Having said that, there isn’t really anywhere else on this diminutive camera Samsung could have alternatively squeezed the flash in. We did notice a longer wait than usual for the Samsung’s flash to sufficiently charge to be able fire however - and the same 3-4 second wait again between flashes, even when the camera is warmed up. 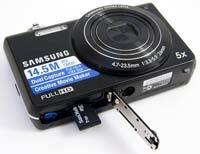 If you squeeze the shutter release button the camera merely pauses and then fires later when it’s good and ready. Keeping design minimalist, there’s no shooting mode dial or wheel anywhere here. Thankfully though, there is at least a mode button to be found on the back plate, a press of which calls up a virtual mode dial on screen, rather than the phone app-like selection that we’ve witnessed on Samsung snapshots such as the MV800 or SH100. Among the usual array of fully auto options is Samsung’s self-stitching panorama function. This helpfully allows the user to watch the end result gradually ‘build’ via a narrow strip displayed at the bottom of the screen. As with competing compacts, the photographer simply pans from left to right through the scene, with finger held down on the shutter release button all the while. The miniature display of the panorama being composited in real time reassures that the eventual image is working before the end result is actually displayed. The ‘joins’ are impressively seamless too. What’s perhaps more of a surprise given the unassuming exterior and price point of the camera is that Samsung has additionally offered up a 3D mode with the ST96, though of course the camera isn’t actually deploying two lenses or two sensors. Unlike Fuji’s pioneering W3 then, the 3D here is derived from a software cheat. The resolution also drops down to two megapixels when this option is selected – not that this is an issue as two megapixels equates to the resolution of a Full HD image anyway. Otherwise the rest of the shooting modes on the ST96 include both scene and subject recognizing Smart Auto capture and Program Auto, along with dual image stabilization mode, video mode, and finally a selection of icon-illustrated scene modes. Among the scene options are the regular shutter-slowing night shot mode, plus landscape, text, sunset and slightly more unusually a dawn mode. In addition we have scene options for shooting backlit subjects and beach and snow scenes. Samsung also strays into the arena of digital filters by including beauty shot, magic frame, exposure merging HDR, plus funnel effect zooming shot options. This is an array of scene modes that dare to be a bit different then, with the inclusion of slightly more inventive settings than we would have expected to find on an £130 point and shoot. Another case in point is the inclusion of stereo microphones on the ST96’s top plate, with speaker sitting just behind. On the same strip we also find a narrow lozenge shaped power on/off button, plus the largest control here in the shape of a shutter release, encircled by a lever for operating the 5x optical zoom. Press the power button and within 2-3 seconds the user is ready to start framing up the first shot, lens having emerged from the body to arrive at maximum wideangle position with a low mechanical buzz and the rear LCD blinking into life. 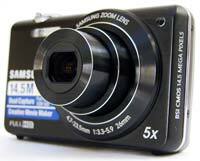 Keep a forefinger on the zoom lever and the camera powers through its core 5x range in all of three seconds. 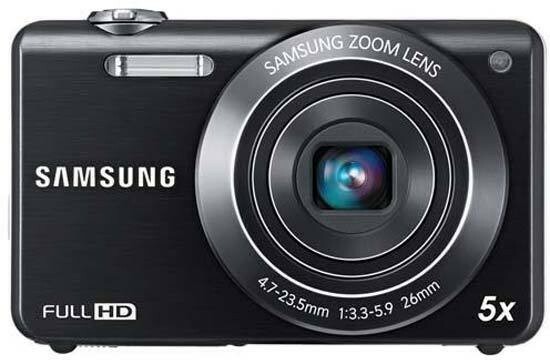 Whilst not lightning fast, the Samsung is certainly sufficiently comparable with the rest of its point and shoot classmates. The modes and settings that the ST96 has ‘in play’ at any one time are conveniently displayed along the right hand side of the screen and across the bottom. These are most expansively illustrated if shooting in Program Auto mode, and when the latter has been selected include the current shot resolution, capture mode, metering mode, flash option chosen, focus mode, as well as shutter speed and aperture, plus indication of battery life and number of possible shots remaining. Adjacent to the ST96’s shooting ‘mode’ button on the camera back we find the self explanatory menu button, which again shows a wider array of shooting options in Program setting. In Smart Auto mode with a press of menu we’re able to adjust stills and video resolution, and alter sound settings and screen display modes, as well as drill into the set up menu and alter the likes of time and date, swap video out from PAL to NTSC or format the memory in use. Standard stuff in other words. Switch to Program however and the photographer has access to a whole lot more via the menu button, including being able to manually adjust ISO light sensitivity, here running from a modest ISO100 to a still modest ISO3200. As well as the ability to select photo size we’re also offered photo quality adjustment, with Super Fine, Fine or Normal JPEG compression levels offered. Exposure compensation can also be adjusted between +/- 2EV, white balance tweaked, the ubiquitous face detection switched on or off, focus area adjusted between centre weighted, multi zone or tracking AF options, metering swapped between multi, spot or centre weighted, plus images adjusted in-camera for contrast, sharpness and colour saturation, and furthermore one of an interesting selection of smart filters chosen. The latter option perhaps needs its own dedicated control or icon on the main shooting mode dial, as these filters are fun but fairly well buried on the Samsung ST96, which is a bit of a shame. The default option upon powering the camera up is the ‘normal’ ‘smart filter’ setting. Spaced along a toolbar that reminded us of the Quick Menu toolbar to be found on Panasonic Lumix compacts, we also have a miniature digital filter for that now commonly provided diorama effect, a corner shading vignetting lens effect, soft focus effect, grainy film effect (resembling a scratched and beaten up negative), a printed comic book-like half tone dot effect, a charcoal pencil-type sketch effect, a fisheye lens effect, a ‘classic’ black and white filter, a retro filter with old Polaroid film style colours, a fuzzy edge ‘oil painting’ option, plus a cartoon, ink painting and sparkly cross filter option. Again a more exhaustive array of creative choices than you’d find incorporated into your average budget snapshot. The remaining controls at the back of the camera are rather more straightforward and expected. A round control pad that immediately falls under the thumb has a familiar ‘OK’ button at its centre for effecting any changes, with a display adjusting option set at 12 ‘o’ clock on the dial (which can summon up a live histogram), a self timer (two seconds or 10 seconds) or continuous capture option at three ‘o’ clock, miniature/macro setting at six ‘o’ clock, and flash settings at nine ‘o’ clock on the dial (here comprising off, automatic, forced flash, red eye reduction, slow sync and red eye correction). At the very bottom of the ST96’s backplate are another two identically sized function buttons. On the left we have a dedicated playback button, and on the right a function button that doubles up as a delete button when in image review mode. A press of the function (or as it’s marked ‘Fn’) button in capture mode however calls up all the aforementioned shooting options listed in the Program mode menu, this time as a toolbar that runs down the left of the ST96’s screen. What we get here then is a useful short cut to those self same selections. On the whole though this Samsung might be unexpectedly packed with options, it remains easy to use. While the left hand side of the Samsung ST96 is devoid of any controls whatever, the only features being two positional screws, over on the other flank of the camera are located a USB port and separate mini HDMI output, hidden beneath a plastic flap. On the bottom of the camera we find a screw thread for attaching a tripod and next to this a cover with slide open mechanism protecting both the battery compartment and microSD card slot. Battery life doesn’t appear to be any great shakes. Indeed it’s distinctly average in that a recharge was needed after a day’s shooting and reviewing. And yet, what of the images the ST96 produces? Is it a case of a touch and go when it comes to performance, or one that belies its inexpensive price tag and in fact delivers more than we were expecting? Click ahead to find out.